The impressive growth of the cloud business has investors betting on the tech giant. Microsoft CEO Satya Nadella. Image source: Microsoft. Shares of software giant Microsoft (NASDAQ:MSFT) rose 12% in 2016, according to data provided by S&P Global Market Intelligence. While Microsoft made plenty of news last year, including the blockbuster acquisition of LinkedIn, the rapid growth of its cloud business seems to be the main thing driving the stock higher. Microsoft reported mostly positive results throughout 2016, consistently beating analyst estimates for revenue thanks to the growing cloud business. Nearly all of the stock's gains occurred following the company's fiscal fourth-quarter report in July, which easily beat analyst estimates for both revenue and earnings. During the fourth quarter, revenue from Azure, Microsoft's cloud computing platform, surged 102% year over year, with usage more than doubling. Microsoft has yet to disclose exactly how much revenue Azure produces, but the company is recognized as a strong No. 2 player in the cloud infrastructure market. Other cloud-based products grew quickly as well. Office 365 commercial revenue soared 54% year over year, and Office 365 consumer increased its subscriber count to 23.1 million. Dynamics CRM Online, the subscription version of Microsoft's customer relationship management product, grew paid seats by a factor of 2.5 compared to the prior-year period. All of these cloud businesses continued to grow quickly during the fiscal first quarter, with Azure revenue surging 116%, Office 365 commercial revenue jumping 51%, and Office 365 consumer adding another 900,000 subscribers. While total revenue and earnings growth was sluggish, Microsoft CFO Amy Hood emphasized that the company was investing and positioning itself for long-term growth. Under CEO Satya Nadella, Microsoft has made good progress transitioning from a PC-centric company to one focused on the cloud. Investors clearly liked what they saw in 2016, pushing shares of Microsoft to their highest level since the dot-com boom more than 15 years ago. There's still plenty of work to do, however. In June, Microsoft chairman John Thompson questioned whether the company was moving fast enough, worried that the traditional software business could disappear in the matter of just a few years. 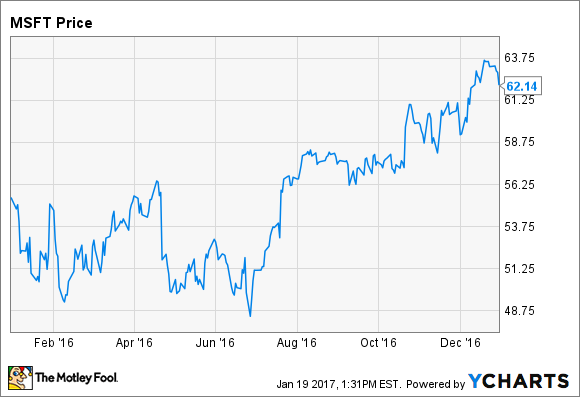 Investor confidence in Microsoft's strategy grew in 2016 along with the stock price. But for the stock to continue on its upward path in 2017 and beyond, Microsoft will need to replace legacy software revenue with cloud revenue fast enough to stave off a significant sales decline. A failure to move quickly enough could undo last year's gains.